It’s a complicated, ephemeral, sensory experience. It’s a fleeting succession of emotions…longing, excitement, bliss, confusion. Poutine is a savory reverie like nothing else I’ve tried. Poutine is a beloved snack in Quebec and particularly popular throughout Montreal. The true beauty of the dish lies in cheese curds that don’t melt completely and remain squeaky when you bite into them. Legend has it that the dish’s name originated in 1957 when restaurateur Ferdinand LaChance received a request from a customer for French fries, gravy and cheese in a bag. He responded, ‘ca va faire un maudite poutine!’ Roughly translated; ‘that’s going to make a damn mess!’ A mess it may have been but also a culinary and cultural hit. Today, poutine is a fixture of the Quebec dining scene and a must-try! I’m a believer that fries are merely a vehicle for sauce…and I don’t mean the sugary, vile, tomato-like substance that comes in a Heinz 57 jar. Fried potatoes should be crispy on the outside and light and fluffy on the inside. They should be covered with a flavorful sauce and eaten with a fork. Like in Europe, the Quebecois understand this concept. Poutine is a real treat and frankly, what dreams are made of. My first experience with Montreal’s favorite fast food was at the ‘resto’ Au Pied du Cochon in the Plateau neighborhood. The meal began with a bottle of pinot noir, crispy pig’s feet salad, lamb shank confit, and then the pièce de résistance…poutine topped with fois gras. The potatoes were crispy, the gravy was creamy, the cheese curds were soft, and the fois gras melted in my mouth. ‘Oh Mon Dieu!’ I said to myself. 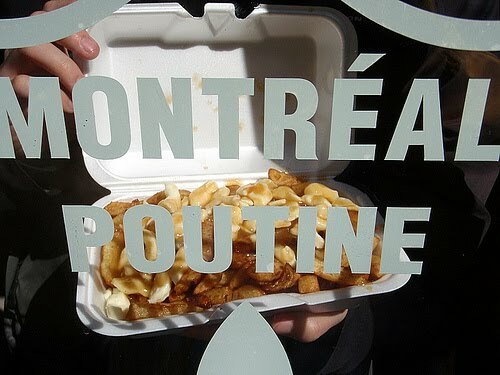 I had to have poutine again to repeat that empyreal, cholesterol induced, high. For a less haute cuisine version, my sources pointed me toward La Banquise in Parc La Fontaine’s north end. It’s a friendly, hippie-meets-hipster diner that specializes in poutine and serves two dozen variations. I entered the ‘resto’ and while inhaling the grease filled air I thought to myself, ‘how many calories is that breath going to cost me?’ I chose Poutine Rachel; fried potatoes, gravy, cheese curds, onions, peppers, and mushrooms. It was fattening, and satisfying. Even more, it provided me with extra padding for the chilly day. Like the different layers of poutine, Montreal is complex, charming, and leaves me wanting plus en plus. An enormous joie de vivre pervades Montreal. It’s a place that embraces its rich history and looks forward to its bright future. It’s the largest city in Quebec province and the most French region in all of North America. It’s modern in every regard. As a UNESCO City of Design it’s got skyscrapers in unexpected shapes and colors, a beautifully preserved historic district, a large area of artist’s lofts, boutiques, cafes, and restaurants. Cold and snowy for nearly eight months every year, it’s a place where the weather is frigid but the people are warm and hospitable. It’s a big city (nearly four million metro residents) but maintains a friendly and welcoming culture. Nearly everyone speaks French and English and effortlessly switches between the two languages for your convenience. Montreal feels like the lovable child of Paris and Denver. It’s chic and outdoorsy, big and intimate, serious and sweet, French and American. Everything about Montreal is enchanting. From the calorific poutine sold around the city, the picturesque cobbled streets of old town, the boutique and café-lined sidewalks of Plateau Mont Royal, the silence and unearthly beauty in the Basilique Notre-Dame, the complicated mazes of the 21 mile underground city, the twang of the Quebecois accent, and the hum of daily life for Montreal residents; this city is has a captivating personality all its own. Back home, after a fabulous trip to Montreal, I can’t help but daydream about the city and all of its complexities... most of all the satisfying and tasty mess, Poutine. Note: Denverites- If you can't make it to Montreal and have a hankering to try Quebec's beloved snack, Euclid Hall serves three versions of Poutine.